Introduction Black British communities are disproportionately burdened by type 2 diabetes (T2D) and its complications. Tackling these inequalities is a priority for healthcare providers and patients. Culturally tailored diabetes education provides long-term benefits superior to standard care, but to date, such programmes have only been developed in the USA. The current programme of research aims to develop the Healthy Eating and Active Lifestyles for Diabetes (HEAL-D) culturally tailored T2D self-management programme for black British communities and to evaluate its delivery, acceptability and the feasibility of conducting a future effectiveness trial of HEAL-D.
Methods and analysis Informed by Medical Research Council Complex Interventions guidance, this research will rigorously develop and evaluate the implementation of the HEAL-D intervention to understand the feasibility of conducting a full-scale effectiveness trial. In phase 1, the intervention will be developed. 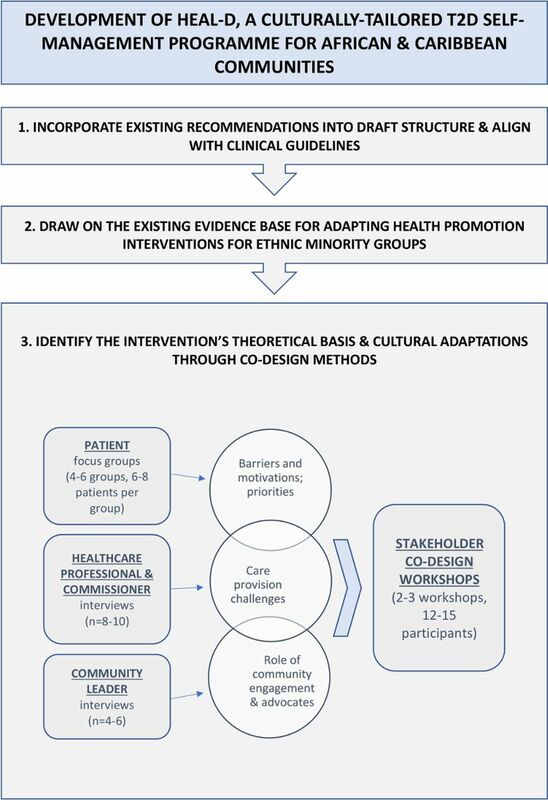 The intervention curriculum will be based on existing evidence-based T2D guidelines for diet and lifestyle management; codesign methods will be used to foster community engagement, identify the intervention’s underpinning theory, identify the optimal structure, format and delivery methods, ascertain adaptations that are needed to ensure cultural sensitivity and understand issues of implementation. In phase 2, the intervention will be delivered and compared with usual care in a feasibility trial. Process evaluation methods will evaluate the delivery and acceptability of HEAL-D. The effect size of potential primary outcomes, such as HbA1c and body weight, will be estimated. 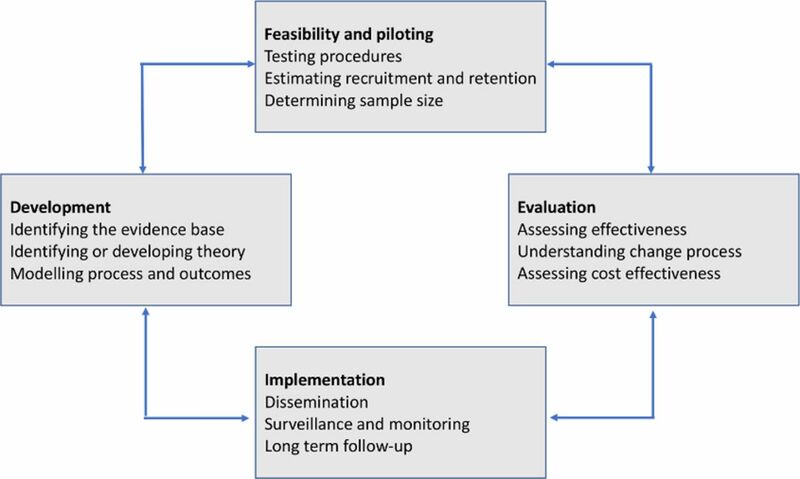 The feasibility of conducting a future effectiveness trial will also be evaluated, particularly feasibility of randomisation, recruitment, retention and contamination. Ethics and dissemination This study is funded by a National Institute of Health Research Fellowship (CDF-2015-08-006) and approved by National Health Service Research Ethics Committee (17-LO-1954). Dissemination will be through national and international conferences, peer-reviewed publications and local and national clinical diabetes networks. Trial registration number NCT03531177; Pre-results. This study employs rigorous complex intervention methodology to develop and evaluate a culturally tailored diabetes self-management intervention. Participatory codesign methods are being used to foster stakeholder engagement in intervention development. The Capability, Opportunity, Motivation and Behaviour change framework is being used to identify appropriate intervention behaviour change techniques. Process evaluation measures are being collected to assess the feasibility of evaluating the intervention in a full-scale trial. The feasibility trial is designed to estimate the effect size of the intervention rather than efficacy, which will be the focus of a future definitive trial. Poor access to diabetes healthcare is a significant issue for minority ethnic groups.2 In the UK, the NHS provides care to all UK residents that is free at the point of delivery. First-line diabetes management is situated in primary care and aims to promote patient involvement and self-management,12 enabling patients to adopt a healthy lifestyle and to manage their diabetes through support and education.13 To achieve this, UK T2D management guidelines recommend that all patients attend a structured education course to teach them the principals of T2D self-management and that this be offered annually from the time of diagnosis.14 Courses are recommended to use a group structure; typically they use face-to-face delivery by a diabetes specialist nurse or dietitian, with lay educator codelivery in some cases.14 Referral to such courses is audited and incentivised through the Quality Outcomes Framework.15 Ethnic minority groups report finding it more difficult to access primary care services16 and are more likely to report that they have not had the opportunity to attend a diabetes education course than white populations.17 Specifically, African-Caribbean (AfC) communities often report a distrust of medical advice and a desire for natural, non-pharmacological therapies.18 Furthermore, healthcare professionals are perceived as lacking cultural understanding19 and their advice as lacking cultural relevance20 or being poorly adapted to culture and needs,18 despite their intentions; these issues may contribute to the poorer diabetes outcomes and increased morbidity experienced by AfC patients. A two-phase programme of research is proposed in which a culturally tailored, evidence-based self-management programme for T2D in African and Caribbean communities, called Healthy Eating & Active Lifestyles for Diabetes (HEAL-D), is developed, followed by a feasibility trial. The intervention curriculum will be based on existing evidence-based guidelines for T2D14 27 to enable it to have potential to be embedded into clinical practice; codesign methods will be used to identify the optimal structure, format and methods of delivery and to ascertain appropriate adaptations that are needed to ensure cultural sensitivity of the content. The purpose of this article is to present the protocol for the development and feasibility trial of HEAL-D. The overall aims of this research are to develop a culturally tailored, evidence-based self-management programme for managing T2D among AfC communities in primary care, called HEAL-D, and to determine the feasibility of evaluating HEAL-D through a future effectiveness trial. Develop a self-management programme, based on existing evidence-based diet and lifestyle guidelines, appropriately tailored for AfC patients through codesign methods. Establish the feasibility of conducting an effectiveness trial of HEAL-D, considering issues such as participation rates and potential effect sizes. Guided by the Medical Research Council’s Complex Interventions framework28 (figure 1), two distinct phases of research are proposed: phase 1 is a formative phase in which the HEAL-D intervention will be developed; and phase 2 will evaluate the HEAL-D intervention in a feasibility trial. Study recruitment began in April 2017; the study duration will be 36 months. Medical Research Council’s framework for the development and evaluation of complex interventions. Reproduced from Craig et al. British Medical Journal. 2008; 337:a1655. Schematic diagram of phase I: development of HEAL-D using evidence synthesis and codesign methodology to design a culturally tailored self-management programme for T2D in African and Caribbean communities. HEAL-D, Healthy Eating & Active Lifestyles for Diabetes; T2D, type 2 diabetes. Achieve 5%–10% wt loss or weight maintenance in those of healthy weight. Undertake 150 min/week of moderate-to-vigorous intensity aerobic physical activity plus two sessions/week of strength training. Balance carbohydrate intakes through portion control and promotion of low glycaemic index and wholegrain sources. Limit saturated fat intake (<10% of energy intake), replace with monounsaturated fats. Limit salt intake (<6 g per day). Consume oily fish at least twice per week. Behavioural interventions should have a theoretical underpinning28 32 so that the changes that are expected, and how these will be achieved, can be predicted from consideration of known behaviour change techniques. While there have been a number of interventions tailored to support diet and lifestyle behaviour change in AfC communities,33 their theoretical underpinning has rarely been drawn out or clearly presented. The theoretical underpinning of HEAL-D will be developed through a combination of key themes from the published literature and new primary research. In the literature, collectivism and the importance of social interaction for people of AfC ancestry is well reported,29 and the provision of a social support group, or inclusion of a family member, has been shown to be particularly effective in lifestyle interventions in African-American communities.34 35 These findings suggest social learning theory, which focuses on promoting behaviour change through social interaction, role modelling and social comparison, may be a relevant behaviour change theory for our intervention. Notably, much of literature that identifies the drivers of health behaviours in AfC communities and may, therefore, inform the theoretical basis of an intervention comes from the USA, and it is not known to what extent these findings apply to AfC in other regions. One of the reasons we will use codesign methods will be to understand the relevance of these existing themes to the UK context and enable us to identify themes that are important to black British communities. Identify the theoretical underpinning of HEAL-D and its mechanisms of action. Identify appropriate cultural adaptations for the intervention. Understand issues of intervention implementation. Focus groups, 8–10 groups of 6–8 participants, will be conducted with patients with T2D of AfC ethnicity, recruited through local churches, mosques and community groups, as well as through general practitioner (GP) practices in London. The focus groups will be conducted in local accessible community venues, for example, church hall, library and community centre. Patients will be purposively sampled to get a spread of socioeconomic position, generational status and ancestral origins, as principal factors impacting on health status, healthcare access and cultural behaviours in these groups.36–38 Separate focus groups will be conducted with men and women, and patients of direct African versus Caribbean ancestry, as they report different cultural barriers/facilitators to lifestyle change.36 37 A topic guide (box 1) based on themes identified in the literature will be used to steer discussions and ensure coverage of key themes while encouraging free discussion of opinion/perspective. Focus groups have been selected to enable us to understand normative needs, as suited to the development of a community intervention. Knowledge and perceptions of diabetes, and diet and lifestyle advice for managing diabetes. Current practices relating to diabetes self-care, and diet and lifestyle. Health concerns/priorities in relation to diabetes. Motivations and barriers/difficulties relating to diabetes self-care, weight management and diet and lifestyle. Experiences and perceptions of diabetes care/education and barriers to accessing care. Experiences of behaviour change in relation to diabetes, weight, diet and lifestyle—successes and failures. Role of family/friends/communities in influencing and shaping knowledge and behaviours in relation to diabetes, diet and lifestyle. Health problems affecting the community and diabetes impact on health within this context. Attitude of the community towards health, medicines and doctors. Role of community leaders in promoting health and community activities. Diabetes health promotion activities within the community. What worked and what did not. Barriers and facilitators to positive diabetes behaviours within the community. Advice about engaging the community: who are the role models; what will engage and help people; how can healthcare and community work together. Experience of supporting African and Caribbean patients. What are the issues. How could things be improved. What factors make successful T2D management likely. Involvement in community activities and experience of working with community leaders and lay educators and suggestions to improve partnerships. Difficulties and challenges with offering a tailored lifestyle intervention. Semistructured interviews will be conducted with 8–10 healthcare providers, including general practitioners, practice nurses, diabetes specialist nurses, diabetes specialist dietitians and commissioners. The interviews will cover issues relating to healthcare needs and engagement of AfC patients, experiences of delivering healthcare to AfC patients and barriers and facilitators to working in partnership with community groups to deliver care for AfC communities (box 1). Interviews have been selected for this part of the study to enable us to gather a full range of experiences and therefore optimise implementation. Community leaders representing faith and non-faith institutions (n=4–6) will be invited to participate in semistructured interviews. Leaders will be identified initially through existing networks, for example, Diabetes UK Community Champions initiative. Word-of-mouth and ‘snow-balling’ techniques that are highly effective within these communities will be used to recruit a wider network. The interviews will cover issues relating to the role of community networks in promoting health of AfC communities, sustaining health among community members and opportunities for greater impact (box 1). The focus groups and interviews will be digitally recorded and transcribed verbatim. The data will be analysed using the framework approach in NVivo (QSR International), theoretically driven by socioecological theory to identify themes relating to issues at the individual, family, community and healthcare delivery levels and how these influence self-efficacy and behaviour change. Our analysis will identify priority behaviours of focus for the intervention, key barriers and facilitators to behaviour change and healthcare engagement, favoured settings and a rudimentary draft of the cultural adaptations. Deviant case analysis, which is consideration of cases that do not fit the general picture, will be undertaken, though our primary interest is in the commonalities as this is a community-level intervention. Primary coding and development of a coding scheme will be carried out by a single researcher; a second researcher will independently use this coding scheme to code 20% of the data for cross-comparison to improve dependability. This will provide methodological rigour required for confidence in the analysis of the qualitative data. The themes will be fed back and discussed with a service user group (SUG), which will consist of representatives of patients, healthcare providers and community leaders. The SUG will be set up to inform and guide each stage of the research plan and will be a forum through which the research team can seek the opinion of key stakeholders, in this case particularly relating to interpretation of the qualitative data and to ensure trustworthiness of conceptualisations. The SUG will also review research documents, such as patient information sheets and questionnaires, and provide feedback on their content and suitability for the communities of focus. We will divide our data into behavioural ‘barriers’ and ‘facilitators’ where possible. 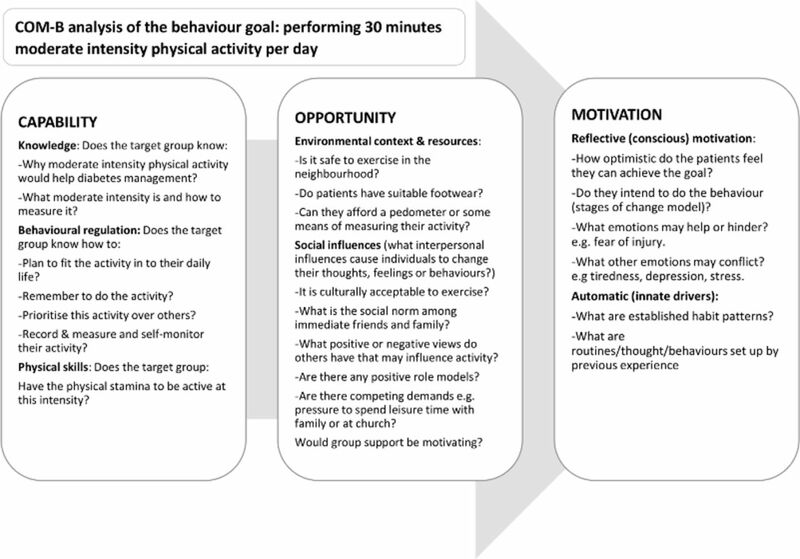 To ascertain appropriate behaviour change techniques for our intervention,32 we will map our analysis onto the Capability, Opportunity, Motivation and Behaviour (COM-B) framework from the Behaviour Change Wheel39 (figure 3), and then in each case, consider the outcome behaviours that our intervention will aim to achieve; a worked example is shown in figure 4. We will use the COM-B framework to identify appropriate functions of our intervention to optimise facilitators and overcome barriers to achievement of planned outcomes, for example, ‘education’ for capability barriers, ‘modelling’ for opportunity and motivation barriers. Finally, we will select specific behaviour change techniques, for example, education and goal setting, that focus on the specific functions we have identified. We will also look to identify other themes that arise from the data, which might not map clearly onto the COM-B framework (eg, contextual themes relating to the health system) but which may inform our intervention theory as well as help us to understand issues of implementation (eg, favoured settings and timings). Through this analysis, we will identify our intervention theory that we will draw on for the next stage of the study, as documented through a logic diagram. The Capability, Opportunity, Motivation and Behaviour (COM-B) framework and behaviour change wheel; a framework for developing behavioural interventions. Reproduced from Michie S et al. Implementation Science. 2011; 6:42. Applying the COM-B behaviour change framework to the development of the HEAL-D intervention; identifying theory of change. COM-B, Capability, Opportunity, Motivation and Behaviour; HEAL-D, Healthy Eating and Active Lifestyles for Diabetes. Following evaluation of the focus groups and interviews, our stakeholders, 12–15 patients, healthcare providers, commissioners and community leaders will be invited to participate in a series of 2–3 half-day workshops, held in community locations. The workshops will seek to gain stakeholder involvement in developing the details of the interventions. This will include determining the setting, the media channels, structure and delivery, as well as steering the research team to understand and respond to literacy and numeracy needs. The workshops will endeavour to reach a consensus opinion from attendees, but where stakeholders have different needs and a consensus cannot be reached, the research team will consult with the SUG to make decisions on the way forward and consider where there is scope for the intervention to be structured to meet these different needs, for example, delivery in a range of settings. In the first workshop, the research team will feed back the findings of the focus groups and interviews; anonymised interview extracts will be presented to illustrate the key themes and issues that were identified. The stakeholders will be asked to discuss the themes and behavioural targets in small groups, using directed tasks/questions to facilitate the discussions. Following the small group discussions, the researchers will facilitate discussion as a whole to clarify/confirm interpretation; open discussion/debate will be encouraged to examine the themes in depth and for all stakeholders to agree a mutual understanding. In the second workshop, elements of the proposed intervention will be presented for comment, refining and development. Using scenarios, the stakeholders will be asked to brainstorm, in small groups, key issues relating to the scenarios. For example, the moderator will present scenarios relating to the intervention setting and the attendees will be asked to discuss and identify the pros and cons of each, and then feed back their discussions to the other attendees. The attendees will be asked to review existing educational/support materials, for example, leaflets and videos, and provide feedback on, for example, language/phrasing, content, pitch and understanding. The research team will then facilitate cross-discussion between groups to develop the conclusions and a consensus. In the final workshop, draft intervention materials, developed from workshops 1 and 2, will be presented. For example, media channels that could be used to promote behaviour change such as testimonials, storytelling and cooking demonstrations. The stakeholders will be divided into small groups to discuss and provide feedback on the acceptability of the components of the intervention and identify potential barriers to engagement. Following the small group discussions, the researchers will facilitate feedback and encourage discussion as a whole to clarify/confirm the researcher’s interpretation. The intervention template may be further refined and will be developed into the detailed programme. Evaluate the HEAL-D intervention, particularly its theoretical under-pinning, acceptability, fidelity, issues of implementation and sustainability. Evaluate the feasibility of trial procedures, considering issues such as rates of recruitment, retention, completion and contamination. Estimate the effect size of potential trial outcomes including HbA1c, weight, waist circumference, blood pressure, dietary intake, physical activity levels, diabetes knowledge and quality of life, to inform an effectiveness trial. The feasibility study will use a randomised controlled design, with individual patients as the unit of randomisation, evaluating HEAL-D against usual care. In addition, there will be a cohort of phase 1 codesign patients who will be allocated to the intervention arm (not randomised) because their involvement in the intervention design phase would contaminate the control arm. These patients will be included in the feasibility study to enable us to evaluate the impact of former involvement on intervention engagement, acceptability and ownership. Participants will principally be recruited from general practice in the London Boroughs of Lambeth and Southwark through screening of referrals for structured education and letters of invitation to patients with established T2D. In addition, participants from the phase 1 codesign study will be invited to participate, and self-referral methods will also be used, for example, posters and advertisements in community locations. Patients with diagnosed T2D who are of African or Caribbean ethnicity and with capacity to provide fully informed consent to participation in research will be eligible to participate in the trial. Ethnicity will be self-declared using the standard NHS ethnicity categorisation questionnaire. Patients who are unable to communicate in English and patients with complex therapeutic dietary needs may be ineligible to participate if their individual needs are deemed incompatible with the aims of the intervention. This is because the intervention will provide general diet and lifestyle advice for the self-management of T2D in a group setting; in cases of patients with certain comorbidities, for example, advanced renal disease, the intervention may be inappropriate for the individual, and the group nature of the intervention will prevent their individual needs from being addressed. A pragmatic sample size of 120 patients is anticipated to be sufficient to evaluate the programme, allowing for 20% dropout/non-completion; 80 patients will be randomised, 40 in each arm, and a further cohort of patients (n=40) from phase 1 will be allocated to the intervention arm without randomisation. As this is a feasibility trial, it will not be powered to detect statistically significant intervention effects. A primary objective of the study is to provide estimates of key parameters such as potential effect sizes, recruitment and retention rates of the trial and participation rates of the programme to enable the optimal design of a full-scale trial to be determined. Participants in the control arm will continue with usual care deemed appropriate and delivered by their primary care team, which may include referral to group structured education and/or one-to-one consultations with healthcare professionals. Participants in the intervention arm will be offered the HEAL-D programme, which will deliver a curriculum of culturally tailored, evidence-based diet and physical activity education and behaviour change in a group setting. In line with clinical guidelines, the programme will be delivered by trained educators (external to the research team); favoured educators (eg, lay educators vs healthcare professionals) will be identified in the codesign process. The details of each session, particularly the behaviour change techniques and corresponding activities/materials, will be identified through the codesign work. An introduction to T2D self-management principles. Physical activity in T2D management. In line with clinical guidelines for diabetes structured education, the education sessions will be delivered through educator-led interactive discussion; however, support materials will be provided to reinforce the learning, detailing evidence-based diet and physical activity guidance, which is culturally tailored for the African and Caribbean communities. We will use a mixed methods approach, collecting a range of quantitative and qualitative data, to evaluate the intervention and the feasibility of trial procedures. Biomedical outcomes: a 5 mL venous blood sample will be taken for analysis of HbA1c and total HDL-cholesterol and LDL-cholesterol and triglycerides. Systolic and diastolic blood pressure will be measured using an automated sphygmomanometer. Anthropometric outcomes: body weight will be measured using digital scales, with the patient wearing light clothing (without shoes); height will be measured, using a stadiometer, without shoes; body mass index will be calculated as (weight [kg]/height [m2]). Waist circumference will be measured with the patient wearing only light clothing, at the midpoint between the lowest rib and the iliac crest. Diet and physical activity behaviour outcomes: dietary intake will be assessed through completion of a 24-hour diet recall, using the structured multiple pass interview method, and physical activity through 3-day Actiwatch accelerometer assessment and completion of the International Physical Activity Questionnaire. The following validated self-complete questionnaires will be administered to assess: diabetes knowledge (Short Diabetes Knowledge Instrument40); diabetes and diet knowledge and competence (Perceived Diabetes & Dietary Competence37); empowerment (Diabetes Empowerment Scale-Short Form41); social support (Multidimensional Scale of Perceived Social Support42); diabetes distress (problem areas in diabetes (PAID)-543); and quality of life (EuroQol (EQ)-5D-3L44). Statistical analysis: given that this is a feasibility study with a small sample size, descriptive statistics will be used (χ2 test and Fisher’s exact test). Differences between the groups in all outcomes will be estimated with 95% CIs. The descriptive data will provide stable estimates of the variability of continuous outcomes by group and provide estimates of differences between the groups in means and proportions for the key outcomes. The SD of the mean change in HbA1c will be estimated by arms and used to derive the sample size calculation for a subsequent trial. Test the intervention theory and whether the mechanisms of change operationalise as hypothesised. Understand how the multiple components of the intervention interact. Evaluate contextual factors that influence operationalisation of the intervention’s theory/mechanisms of change and any unintended effects of these factors. Evaluate whether the intervention is differentiable from ‘usual practice’. Evaluate implementation of the intervention, particularly ‘reach’ (eg, who receives the intervention), ‘dose’ and completion rates, and intervention fidelity (eg, coverage of core materials and learning objectives during delivery, and the extent to which the programme is delivered in accordance with the delivery manual, what adaptations are undertaken and why). Evaluate acceptability of the intervention to patients, healthcare professionals and commissioners. Evaluate intervention embedding and sustainability, for example, what are the barriers and facilitators to the uptake of the intervention in current care pathways. A range of quantitative and qualitative data will be collected, as detailed in table 1. Attendance records, observation checklists, session/programme evaluation forms completed by patients and records of session activities completed by educators will provide quantitative data and will be used to evaluate a number of process domains, as indicated in table 1. Our process evaluation will mainly focus on qualitative evaluations, with which we will use inductive reasoning to determine whether the intervention requires further development and adaptation. Patient interviews and focus groups, and interviews with educators, healthcare professionals and commissioners, and session observation notes will provide qualitative data for the evaluation of a number of process domains, as detailed in table 1. Several different pathways of recruitment will be implemented, for example, screening of primary care databases and letters of invitation, face-to-face referral during medical appointments, self-referral via posters and word-of-mouth referral. We will assess uptake rates from these different pathways to enable us to identify the most effective methods and assess the feasibility of recruiting for a full-scale trial. We will assess the rate of retention both within the HEAL-D intervention (ie, numbers completing each session and the full programme) and the feasibility trial (ie, numbers completing baseline and endpoint assessment visits). We will evaluate the feasibility of randomising and retaining a control arm by assessing dropout rates and comparing these between the study arms; we will also interview control arm patients to explore the acceptability of being assigned to the control arm. We will assess the frequency of missing data and any trends in which data is missing, for example, self-complete questionnaires, blood measures, to assess the feasibility of our data collection methods. We will interview patients from the control arm to explore issues of contamination, for example, did their participation in the trial promote change in self-management behaviours or motivate information-seeking behaviours, did they know anybody in the intervention arm or discuss the intervention with anybody. Service user involvement is intrinsic to this proposed research, which uses participatory methods to engage patients and other stakeholders in the intervention design. The protocol provides extensive detail of how patients will be involved in the design, recruitment, conduct and dissemination of the research. All data will be anonymised and data protection protocols followed. The study findings will be disseminated to the scientific community via conference presentations and peer-reviewed manuscripts and to healthcare professionals via national and local clinical networks. The findings of the study will be communicated to our participants and local communities via the community networks and figureheads who we will engage in our participatory methods; we will give presentations at church events and publish a newsletter via our study website (www.heal-d.co.uk). This paper presents the protocol for the design and feasibility testing of HEAL-D, a culturally tailored T2D self-management programme for UK African and Caribbean communities. This study will employ rigorous complex intervention methodology to develop and evaluate the implementation of a culturally tailored T2D self-management intervention. The intervention’s curriculum will be based on existing evidence-based guidelines for diet and lifestyle management of T2D; participatory codesign methods will be employed to foster community engagement and partnership. We will use a ‘bottom-up’ approach to identify the cultural adaptations of our intervention and identify its theoretical basis through thematic analysis and the COM-B change framework. The feasibility study will provide us with key information about the feasibility of running a full-scale trial of HEAL-D, and process evaluation methods will enable us to understand how and why the intervention is effective or ineffective. To date there have been no tailored education programmes for black British communities. Indeed, it is not known to what extent culturally tailored care is needed for black British communities as little work has been undertaken with these communities. Our codesign work is intended to explore the sociocultural barriers and facilitators to behaviour change and structure HEAL-D accordingly. We acknowledge that we are likely to find huge diversity within our black British communities and culture will likely be only one of many important factors that affects their health behaviours. However, our codesign work will provide a more comprehensive theoretical underpinning for the content of our programme than that which currently exists and will provide us with a framework on which to evaluate the effectiveness of our programme. This work will provide essential information and evaluation to inform the design of a future definitive trial. Estimating the current and future costs of Type 1 and Type 2 diabetes in the United Kingdom, including direct health costs and indirect societal and productivity costs [Internet]: York Health Economics Consortium Ltd, 2012.
. The health of minority ethnic groups. London: Joint Health Surveys Unit, National Centre for Social Research, Department of Epidemiology and Public Health at the Royal Free and University College Medical School, 2006. Healthcare for London. Diabetes guide for London, 2009. London Assembly. Review of diabetes care in London, 2013. Department of Health. Improving quality of life for people with long term conditions. London, UK: Department of Health, 2013. Department of H. National service framework for diabetes standards, 2001. National Institute for Health and Care Excellence. Type 2 diabetes in adults: management (NG28), 2015. National Institute for Health and Care Excellence Quality and Outcomes Framework indicator. MN27: The percentage of patients newly diagnosed with diabetes, on the register, in the preceding 1 April to 31 March who have a record of being referred to a structured education programme within 9 months after entry on to the diabetes register, 2011.
. No patient left behind: how can we ensure world class primary care for black and minority ethnic people? London: Department of Health, 2008. Healthcare Commission. Managing diabetes: improving services for people with diabetes, 2007.
. Health beliefs of African-Caribbean people with type 2 diabetes: a qualitative study. Br J Gen Pract 2007;57:461–9.
. Towards a culturally competent system of care. Washington D.C: Georgetown University Child Development Center, CASSP Technical Assistance Center, 1989.
. Culturally appropriate health education for type 2 diabetes mellitus in ethnic minority groups. Cochrane Database Syst Rev 2008;3:CD006424.
. Culture and Psychology. Pacific Grove, CA: Brooks/Cole, 1996.
. Cultural sensitivity in public health: defined and demystified. Ethn Dis 1999;9:10–21. Medical Research Council. Developing and evaluating complex interventions: new guidance, 2006. National Institute for Health and Care Excellence. Behaviour change: individual approaches. Report No. : Public health guidelines (PH49), 2014.
. A review: maximizing social support-a neglected strategy for improving weight management with African-American women. Ethn Dis 2004;14:212–8. Contributors All authors have made substantial contributions to this study. LMG, CR and SH were responsible for the conception and design of the study. All authors developed the protocol and study approach. LMG drafted the manuscript. All authors read, revised and approved the final manuscript. LMG is guarantor. Funding This report is independent research arising from a Career Development Fellowship (LMG, CDF-2015-08-006) supported by the National Institute for Health Research. Disclaimer The views expressed in this publication are those of the author(s) and not necessarily those of the NHS, the National Institute for Health Research or the Department of Health. Ethics approval The study protocol has been approved by the Health Research Authority (London Fulham Research Ethics Committee; 17/LO/1954); all participants will provide written consent prior to participation.